For the past six seasons, Hill-Murray and St. Thomas Academy have had a hammerlock on the Classic Suburban Conference championship, with one of the teams winning the league title each of those seasons. In each of those seasons, both the Pioneers and Cadets have finished no worse than second. As always, there were conference championship implications when these teams met on Saturday, Dec. 10, at Aldrich Arena. The Cadets were ranked No. 2 in Class A, coming off a win against Duluth Marshall to open the season. 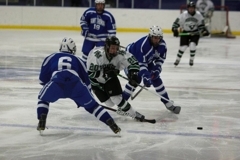 Hill-Murray suffered tough losses to Benilde-St. Margaret's and Burnsville, two teams ranked in the top 10 in Class 2A. The Pioneers had won 18-straight Classic Suburban games dating back to Feb. 6, 2010. That loss was to St. Thomas Academy. If there ever was a time to end that streak, this may have been it, but Pioneers goalie John Dugas was in the way of a Cadets' victory. 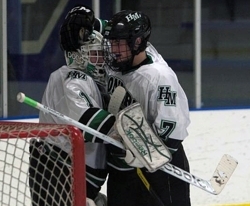 His 35 saves propelled Hill-Murray to a huge 2-1 win against the Cadets. "He's played really well for all year, and tonight I think he won it for us," Pioneers forward Andy Faust said. "I thought he was our best players the first two games. He's been really consistent and has been really what a young team like us needed." 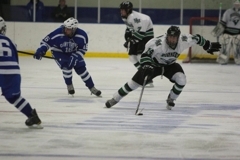 Hill-Murray was able to score two goals in the third period to take a 2-1 lead with a short-handed goal by Faust and an even strength tally by Zach LaValle to seize momentum for the first time in the game. However, when it came down to crunch time, the Cadets poured it on and forced a penalty, putting Pioneers forward Jake Guentzel in the penalty box. With only one minute, 12 seconds left, St. Thomas Academy pulled goaltender David Zevnick and started to unload on Dugas. Instead of going into a shell, Dugas stood his ground and made save after save to give Hill-Murray a much needed win against a high-caliber opponent. "It was one of the most fun experiences I have had, especially for a goalie," Dugas said. "There are times you wish to be in situations like that where the game is down to the wire and you have to stop them. You dream of winning games like that and it was just a great moment." In the third period alone, Dugas stopped all 13 shots he faced, with numerous chances coming in the final moments as the Cadets made a late charge. "Dugas was unreal," LaValle said. "He played a great game and gave us a chance to win the game. He was just unreal tonight." 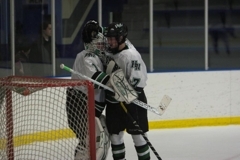 "Whenever you play a goalie like that, that is what hockey is," Cadets coach Greg Vanelli said. "Sometimes it comes down to your goalie and it's tough to beat a hot goalie." What Dugas did was give Hill-Murray a win it needed against one of the elite teams it plays against early in the season. After two losses to begin the year, Hill-Murray bounced back in a big way to put the Pioneers back on the Class 2A map. "He has definitely stepped up for us," Pioneers coach Bill Lechner said. "There were times last year when he would look at me as if he were asking me when he was going to play. "He's playing this year and playing well." Dugas has needed to because the schedule has not allowed for him to take a breather. "It's been fun and I didn't think it would have worked out if we didn't play these teams," Dugas said. "It's a little sink or swim situation. Luckily I'm swimming." St. Thomas Academy dominated the first two periods of play, had a 1-0 lead in the third period and had a power-play chance to add to all that. However, Hill-Murray's Faust got his stick on the puck and went work with Jake Guentzel on a 2-on-1. Faust slid a pass to Guentzel and just about everyone at Aldrich Arena was expecting a shot. Instead Guentzel passed it right back to Faust, who made no mistake in burying the puck. 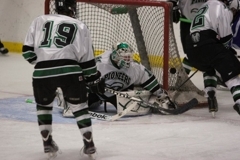 "That was a huge boost to our morale," Pioneers goaltender John Dugas said. "Once we got that first one, we played a lot better." For as well as the Cadets played, it very well might have been that lapse on the power play that deterred their chance of taking down Hill-Murray. "Hate to give up a tying goal while on the power play," Cadets coach Greg Vanelli said. "That gave them life and that's what happens when you give up a goal like that." Hill-Murray did not change the way it played once it tied the game. "That got the momentum going," LaValle said. "Jake and Faust have been playing great on the penalty kill and they got things going for us.". In the Cadets zone, LaValle pounced on the puck, cut to his right and unloaded a hard wrist shot to beat Cadets goalie David Zevnik to give the Pioneers a lead they would not relinquish. It was LaValle's team-leading fourth goal of the season. "This is a big game," LaValle said. "They always say big players are supposed to come up in big games, so you have to scrap, and if it's a scrappy goal, it's a goal. 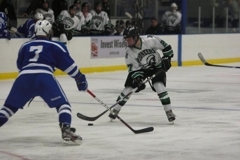 "This is a huge game, especially in our conference," Hill-Murray coach Bill Lechner said. 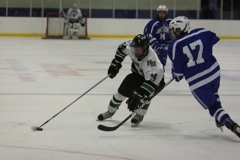 "A lot of times the conference comes down to Hill-Murray or St. Thomas Academy. That is not to sound arrogant or cocky. That is just how it has been lately." 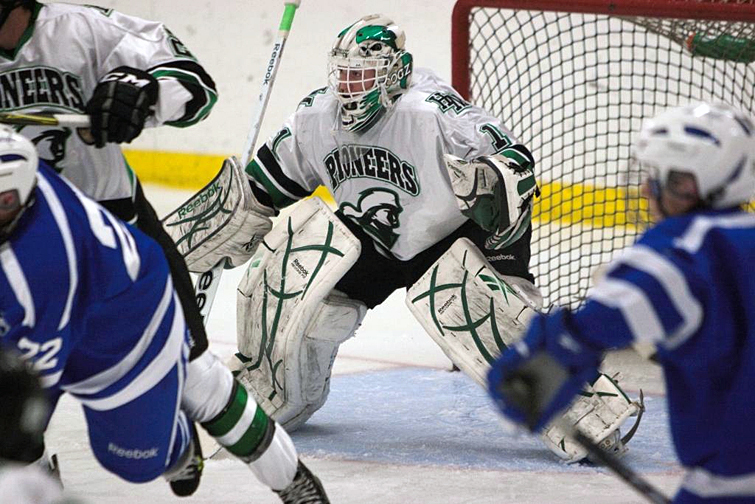 John Dugas made 35 saves to give Hill-Murray a 2-1 win against conference rival and No. 2-ranked (Class 1A) St. Thomas Academy on Saturday, Dec. 10, at Aldrich Arena. Henry Hart was the only Cadet to beat Dugas, scoring on a rebound in the second period. St. Thomas Academy was up 1-0 heading into the third and had a power-play opportunity, but Andy Faust put the Pioneers on the board when he and Jake Guentzel went to work on a two-on-one, with Faust putting away a one-timer past Cadets goalie David Zevnik. Later in the period, Zach LaValle picked up the puck from the half boards and unleashed a hard wrist shot that beat Zevnik to give the Pioneers a 2-1 lead. Hill-Murray had to hold off a big surge late in the third as the Cadets started to press the issue. To make matters even more difficult, Guentzel picked up a slashing penalty with 1 minute, 12 seconds left in the third. 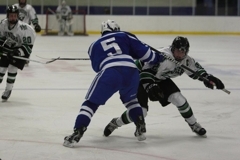 St. Thomas Academy pulled Zevnik for an extra attacker and had a six-on-four advantage for the rest of the game. Dugas held his own, making two big glove saves. For the third period, Dugas stopped 13 shots. Zevnik, stopped 19 of 21 shots. Guentzel chipped in with both assists on the Pioneers' goals. Hill-Murray improves to 2-2-0 (1-0-0 Classic Suburban Conference). The Pioneers are on the road to play Mahtomedi on Dec. 15, host Wayzata on Dec. 17 and play another big home game against rival White Bear Lake on Dec. 22. The loss was the first of the season for St. Thomas Academy 1-1-0 (0-1-0 CSC). The Cadets' next game is a road test against Rochester Lourdes on Dec. 15. Dugas had some big skates to fill this season, stepping in for three-year starter Tim Shaughnessy. Dugas proved he can handle the spotlight in a big game. He made 13 saves in the third period, including several in the closing minute when St. Thomas Academy had a power play and pulled its goalie for an extra skater. When the Pioneers needed a spark, Faust delivered with a shorthanded goal in the third period to tie the score at 1. The quarterback on the Pioneers' football team, LaValle had a John Elway moment, leading his team to victory down the stretch in the final minutes. His goal late in the third period was the game-winner and gave Hill-Murray a big win after an 0-2-0 to start the season. His exaggerated fist-pumps after the goal just proved how big this early season battle was.